Note: I began this post in July. I cannot believe that an entire year has gone by already. It’s been a crazy last few months, and although I have completed a couple of commissions, whipped up some new pairs of slim Burda 01/2016 #135 pants, altered and mended clothing and made a winter coat, it’s only this weekend that I have finally managed to get some pictures of a recent make! Woo hoo! This coming Tuesday is DH’s birthday, and it’s also July, which means Summerlicious in TO. Birthday + Summerlicious = reason for a new dress. 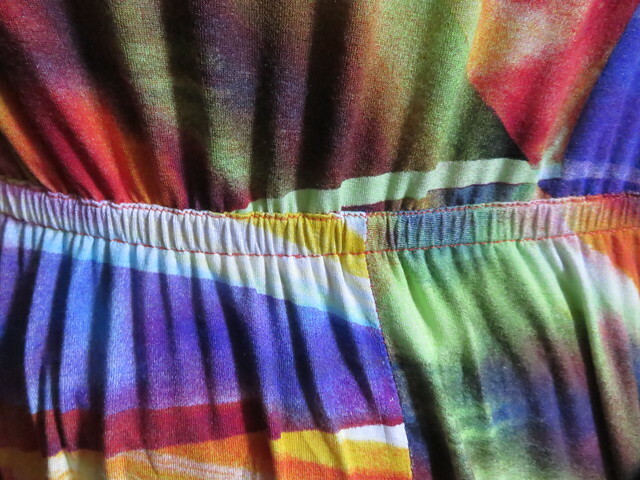 The fabric is a rayon-lycra knit from my local Fabricland, purchased last summer (or the summer before…..???) because it was a) on sale; and b) looked so cheery. 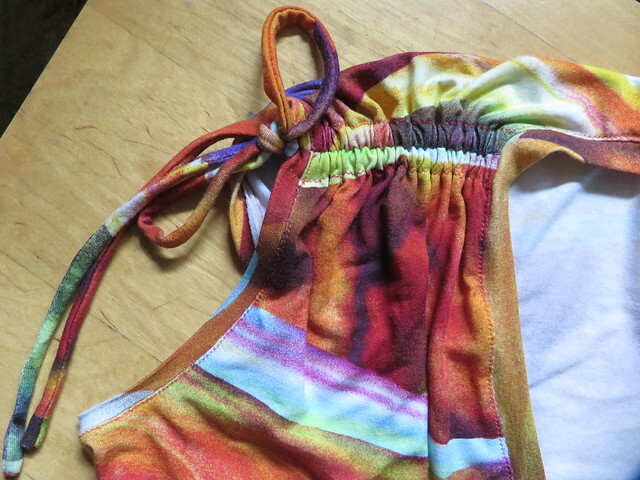 Actually, it probably reminded me of some project I’d seen in Burda Magazine that I really liked, so I purchased it. 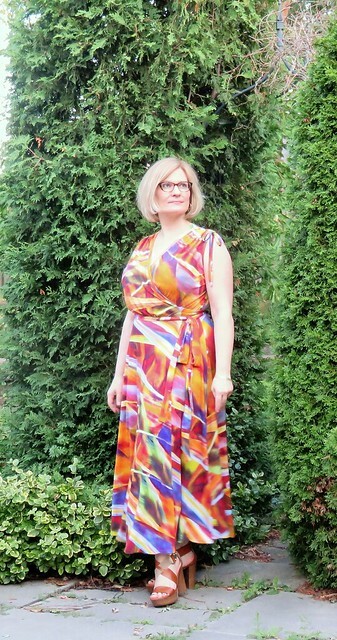 Unfortunately for me, I never make a note of pattern + fabric combinations that randomly pop into mind, especially at that critical moment when they are actually in mind, so I cannot remember what made me think this would be a great maxi dress. In the interest of time (no time to trace a pattern! ), I opened my binder of Vogue dress pattern envelopes, pulled out Vogue 8896, measured the flat pattern, laid out the fabric, and cut.. I made some changes to the shoulders – adding width in the back to match the front shoulders so I could sew channels and run ties to create the gathers instead of just gathering the front into the width of the back shoulders. I used my favourite neckline edging (a long strip of fabric, cut across the grain, 5cm wide and a few cms shorter than the actual to-be-finished armscye or neck opening) and finished the armscyes using the same technique before stitching the shoulder seams so it would be a neat finish for the ties. The skirt was quite heavy, and in the interest of keeping it in place at my waistline without having to constantly adjust it, I stitched the seam 2cm wide instead of 1.5cm and ran 1.5cm wide elastic through then entire length, from left front to right front ties. And then wore it out to dinner! I do have more projects to show you. I have been under a self-imposed deadline to get some things done, photographed and blogged before December 24, when my sewing area will be co-opted into Christmas Dinner With The Family space. Updated December 30th: And here we are…. at the end of the year… The good news: I took photos of my one finished coat project for 2018. Fingers crossed for posting! I’m glad you stated it was July, I was in shock seeing this warm weather next to the snow! 😂 you’ve made a lovely sunny dress there, hopefully the warm weather will come soon so you can enjoy it! Beautiful dress, perfect marriage of pattern and fabric even if you can’t remember the exact source of inspiration! I love the colors! It suits you. How lovely to see you back and looking fabulous in your stunning dress. Fabulous dress, the colours and pattern are amazing! That’s gorgeous! Looks like you got a really great finish as well. That looks fab on you, and the colors are great! I want to see your coat!!!!! Agree with Gabrielle. Totally gorgeous! And I love your elastic waist tip. WOW! That dress is gorgeous!